Beth's Super Awesome Blog: Thanksgiving - who needs The Great Pumpkin, when you can stuff one and eat it! Thanksgiving - who needs The Great Pumpkin, when you can stuff one and eat it! Halloween is over and right behind me - shoot, I think I still have fuzz on the floor of my apartment from my costume (pics to come). But with the holiday just rounding to a close, I already find myself looking forward to the next one, and one of my favorites: THANKSGIVING! Since pumpkins come in unpredictable sizes, cheeses and breads differ, and baking times depend on how long it takes for the pumpkin to get soft enough to pierce with a knife, being precise is impossible. See Bonne Idée for some hints on variations. And speaking of playing around, you might consider serving this alongside the Thanksgiving turkey or even instead of it—omit the bacon and you've got a great vegetarian main course. You have a choice—you can either spoon out portions of the filling, making sure to get a generous amount of pumpkin into the spoonful, or you can dig into the pumpkin with a big spoon, pull the pumpkin meat into the filling, and then mix everything up. I'm a fan of the pull-and-mix option. 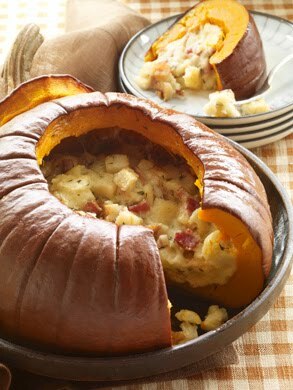 Served in hearty portions followed by a salad, the pumpkin is a perfect cold-weather main course; served in generous spoonfuls, it's just right alongside the Thanksgiving turkey. There are many ways to vary this arts-and-crafts project. Instead of bread, I've filled the pumpkin with cooked rice—when it's baked, it's almost risotto-like. And, with either bread or rice, on different occasions I've added cooked spinach, kale, chard, or peas (the peas came straight from the freezer). I’ve made it without bacon (a wonderful vegetarian dish), and I’ve also made it and loved, loved, loved it with cooked sausage meat; cubes of ham are also a good idea. Nuts are a great addition, as are chunks of apple or pear or pieces of chestnut. wow, that looks so neat - great recipe, thanks for posting! Oh my oh my.... SHOES!!! Butternut Squash Pasta & Another Salad Invention! Pasta + Pizza = Pastapizza!